Infralution Licensing System (ILS) is an award winning, 100% .NET solution for licensing .NET Applications, Controls and Components, ASP.NET Web Applications and Components and Universal Windows Platform (UWP) Apps and Components using simple and secure encrypted license keys. Combine ILS with .NET Encryptor for a complete solution for protecting your Intellectual Property. Combine ILS with IPN.NET (Instant Payment Notification) to integrate with PayPal or other 3rd party ecommerce systems and fully automate license generation and delivery. How does the ILS Authentication system differ from other Product Activation systems? Robustness to Hardware Change - most product activation systems link the activated license to hardware characteristics such as the MAC address, hard drive serial number etc. This means that if the user upgrades their machine or operating system the licenses are invalidated. This can generate a large number support calls and is frustrating for end users. 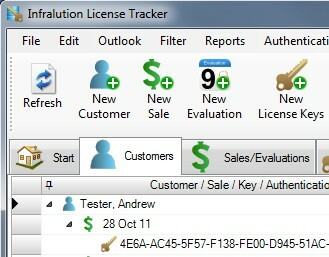 Infralution's authentication system, by default, links the license to the computer name. This allows the user to upgrade their hardware and even their operating system without invalidating their license. This scheme provides a sufficient deterrent to key sharing for most applications and is a good compromise between robustness and security. You can however easily modify the ILS authentication model to link licenses to some other hardware or operating system characteristic. Costs/Dependency - Many licensing companies that offer product activation also want a cut of your licensing fees. ILS includes the authentication web service software that you host on your website at no extra cost. This also means you aren't dependent on a third party company to issue licenses for your products. Our Authentication Web Service will run on shared web hosts with partial trust, which means you don't have to pay for expensive dedicated web hosting. Authentication Control - Infralution's License Tracker application provides a simple and flexible mechanism for controlling the authentication web service. License Tracker allows you to monitor authentications and control authentication parameters for products or individual license keys. Security - the Infralution authentication web service does not include key generation logic or data. This means that even if a cracker gains full access to the website hosting your authentication web service they will be unable to extract the information required to generate valid license keys. In addition all communication with the authentication web service is protected and validated using public key encryption. This means that you don't need to purchase an SSL certificate and host the web service on a HTTPS enabled server to ensure security. Authentication is not the right solution for all applications - that's why Infralution offers a choice of licensing models. Check out this excellent article on Code Project - Piracy and Unconventional Wisdom. It discusses some other factors you should consider when deciding on a licensing strategy. ILS uses a public key encryption algorithm to verify license keys which makes it virtually impossible for a cracker to reverse engineer license keys from your code. Encrypted Licenses - simple encrypted license keys which unlock your application or component with a minimum of complexity and hassle (the original ILS licensing model). Authenticated Licenses - licenses keys are authenticated by contacting an Authentication Web Service when the license is first installed on a computer. The installed license file is locked to the computer and cannot be used on any other computer. Each generated license key contains a unique serial number which guarantees licence key uniqueness and allows tracking of license keys. Additional product information can be encrypted into license keys or downloaded when the key is authenticated allowing you to unlock specific software features. Set expiry dates automatically based on the number of days from when the key is generated or from when it is first authenticated. Change the expiry date for exising license keys to allow support for subscription licensing. Allows your unlicensed application to function as an evaluation version limited by either time or usage (ie fixed number of uses). ILS provides a complete solution for component and control developers. Components and controls licensed using ILS generate runtime licenses which are incorporated automatically by Visual Studio into the clients application. Design time licenses cannot be reverse engineered from the runtime license. Separate assemblies for WPF and Windows Forms provide native UI licensing dialogs to give a consistent look and feel throughout your application. Support for licensing UWP Applications and Components. A separate UWP assembly provides dialogs and support for the UWP asynchronous programming model. Sample projects demonstrate licensing ASP.NET applications using both simple encrypted licenses and authenticated licenses. Authenticated licenses are locked to the website domain. The sample projects include a fully worked example of implementing a floating network license server and client application. Control whether a license can be be used within terminal services. Support for licensing compact framework applications. Applications using ILS can be compiled against any version of .NET from Version 2 onward including .NET 4 Client Profile Framework. Full source code is supplied for the licensing classes you call from your application. This allows the licensing code to be fully integrated into your own applications or components, which means there are no third party DLLs to distribute and the licensing code can be fully obfuscated using your normal obfuscator. You can build as many applications as you want and distribute them without paying any further royalties. Purchase Infralution's IPN.NET(Instant Payment Notification) product to integrate with PayPal or other 3rd party ecommerce systems to fully automate license generation and delivery. Authentication Control - monitor license key authentications and control authentication parameters for products or individual license keys. Customer Management - store and manage your customer information. Easily determine which customers have bought or evaluated particular products. Customizable Key Generation - key generation can be customized to automatically include information about the customer or other details into the key. You can also implement your own form to get additional information to be inserted into the license key. Distributor Integration - XML and CSV sales and evaluation (trial download) data can be imported from 3rd party distributors such as ShareIt! Outlook Integration - integration with Microsoft Outlook (2003 and later) allows sales notifications to be imported directly from your inbox and emails to be created and forwarded using the License Tracker customer database. Full Source Code Option - full source code for the License Tracker application and Authentication Web Service can be purchased separately for those companies that wish to use License Tracker as a springboard for developing their own in-house software. 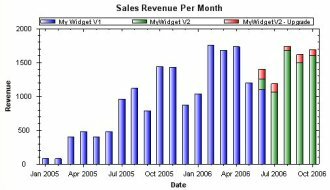 Advanced Sales Reporting - analyse sales revenue over time and break down of revenue by product, distributor and country. Analyse sales revenue over time and break down of revenue by product, distributor and country. What are people saying about Infralution Licensing System? Infralution Licensing System is very easy to use. Their licensing schema is extremly simple to implement in your projects. For the price it is the best licensing software in the present market. Their customer support is fast. I highly recommend this software. We tried various licensing solutions before deciding on Infralution more than a year ago now. To say that we are extremely happy with Infralution is an understatement! Both the product and after sales support is absolutely fantastic and I highly recommend this software to anyone! I have been using the Infralution Licencing System for well over 3 months now and couldn't be more satisfied with my purchase. I found it easy to set up and integrate into my application and on the few times I required assistance, the support was prompt and very helpful. I would recommend this product to any software business looking to take the pain out of software copy protection. Five Star product!